Two Wellington brothers, Godfrey and Bertie, find love and loss in 1895 in the small town of Charles City, Virginia. Godfrey, the older one, is married and expecting his firstborn child, but when tragedy strikes, how will he carry on? Will Malynn Selman, who comes to live at Wellington Cross Plantation, be able to help him through his grief? Meanwhile, Bertie has just proposed to Amanda Adams, but when an old flame comes to live and work at the boarding house, Adams House, will she tempt Bertie into being unfaithful? She is recently widowed and brings her two children with her along with her own troubles. Will the two brothers eventually find happiness? Amanda Adams walked out onto the front porch wearing her best blue dress with leg oâ mutton sleeves and waited for guests to arrive. She was having a birthday party and had invited a few of her family and friends to attend that day. Her actual birthday was in June, but she had delayed a party so that her cousin Jason could have a proper honeymoon with his new wife, Belle Wellington. Belle had worked at the boarding house where the three of them lived and took care of Adams House. Most guests were just passing through town, but one guest had been a particular nuisance and caused a lot of trouble to all three of them at the boarding house. Mister Wade Brewster aka Wayne Trueman, Jr., had forcibly raped Amanda back in February when he first came to visit the boarding house. Heâd been handsome and charming, and sheâd made a terrible mistake. She had ended up being with child and called on a doctor in Richmond to try and get rid of the baby. She didnât think she could bear looking at a baby every day who had been the result of such a brutal act of violence and violation. She found a Doctor Gardner, and heâd come to the boarding house in May to perform the surgery. Gardner ended up having a heart attack and died before completing the surgery, before sewing her up. Sheâd bled a lot and the next day, Doctor William Brown and his wife Ginny had taken over her care. Sheâd taken a long time to heal, both physically and emotionally, and had eventually moved out to the country to stay at her Aunt Paisleyâs plantation for a while. Her savior had been Bertie. Albert Wellington, whom everyone called Bertie, had come to visit her at Carter Manor on a regular basis, and the two of them started taking walks outside on the plantation. First they walked in the garden, then the walks got longer and theyâd walked around some of the crops and even over into the woods a little. He was the sweetest man sheâd ever met, and he knew how to make her laugh. He seemed to care a great deal about her. Brewster, by shooting him after heâd shot Belle in the stomach, was the day she realized she loved Bertie. Heâd sacrificed his life, which he did quite often being deputy of Charles City, but she knew he would do it for her at any given moment, should the need arise. Heâd told her so on one of their walks. That he would do anything for her to prove to her that there were good men still left in this town. Amanda had felt guilty about Belle getting shot and that it was her fault since she was the one who had gotten involved with Mister Brewster. It took her a while to forgive herself, even though Belle said she didnât blame her at all. Sheâd insisted that since Mister Brewster had lived in the boarding house when he was growing up, he wouldâve been back anyway, whether Amanda had taken up with him or not. Amanda knew that was true, but it didnât help assuage her guilt sometimes. She also felt guilt for getting rid of the baby. She had been the cause of an innocent life being terminated. Essentially, she had committed murder. Not actually with her own hands, but it was still her fault. She was the one whoâd asked Doctor Gardner to perform the surgery that terminated the babyâs life. She felt just awful and dreaded that she might not ever have another baby again, either as a result of the procedure or as punishment. She tried most days not to think any of those thoughts and quickly pushed them out of her head as she straightened up her dress. It was her best dress, one she had gotten at Belleâs sister Lillieâs shop. She first wore it to the Wellingtonâs Spring Ball last year. She hadnât been able to go this year because of all the mess with Mister Brewster. She was happy she could wear it now. Sheâd sent it out to the lady who does their laundry, and it had just barely arrived at the boarding house in time â that very morning! She rested a hand on one of the white porch columns and looked around the town until her eyes paused at the Sheriffâs Office where Bertie worked and then the small house down the street from it where he lived. He said he would ask for the whole day off so he could attend the party. She couldnât wait to see him. And dance with him. âAmanda, everything is nearly ready,â Belle said behind her. Amanda turned around as Belle walked out onto the porch. She looked so much happier since sheâd married Jason. Amanda was happy for them both but felt a twinge of jealousy. She wished she could feel so completely happy. She thought she just might be able to, someday. Maybe with Bertie. Belle had cooked all the food for the party, including a ham, a large roast turkey, a round of beef, and scalloped oysters. Also served would be four kinds of finger sandwiches â cucumber, egg salad, ham and goatâs cheese, and tomato-and-basil â as well as fresh vegetables from the garden, tomatoes, cucumbers, and carrots, which would be served alongside peach cobbler, ice-cream, and a three-layer cake made with strawberry jam inside the layers. When Belle first started working for Amanda, she was tasked with cleaning the rooms, cooking, checking people in and showing them to their rooms. After Belle married, she recuperated from her gunshot wound and had only recently started cooking again as her sole duty. Amanda was checking people in, and another lady, Malynn, was cleaning the house. Malynn Selman had been involved with Mister Brewster out in Colorado Springs, Colorado, and had followed him to Virginia just before his tumultuous demise. She had also become impregnated by Mister Brewster and had a baby girl named Mabel who was now two months old. Amanda marveled at the womanâs tenacity and ability to make the long arduous journey all the way from Colorado after such a short period of time since birthing a baby. Malynn had helped Bertie trap Mister Brewster and decided to stay in Charles City after the incident. She said she wanted a quieter place to live and raise her baby. âYouâre welcome, Amanda,â Belle said, stirring Amanda from her thoughts. âItâs the least I could do. from Aunt Paisleyâs while Belle was recuperating, she had taken the same room on the second floor, still not ready to face her ghosts in the other room on the bottom floor. âNo, not yet, but I expect them anytime,â Amanda said. âIâll be sure and tell him. When your brother gets here, Iâll have him help carry the food up.â The food was going to be served in the dining room on the second floor, while the kitchen was on the first floor. After Belle went inside, Amanda turned around and saw Bertie walking her way. She broke out into a big smile and pushed a loose strand of her copper-colored hair behind her ear. Their eyes met, and he began smiling, too. âAmanda, youâre breathtaking,â he said upon reaching the top step of the porch. He took her hands in his, leaned in, and kissed her temple. She smiled and her stomach fluttered a little bit at the thought of dancing with him. âI canât wait, Bertie.â She straightened his collar, just wanting to touch him somewhere. He closed his eyes briefly and took her hand in his. When he opened his eyes, he looked troubled. âIs something wrong?â she asked. âNo, I, uh, no, nothing at all.â He seemed nervous all of a sudden. A carriage pulled up then â it was Jason and Aunt Paisley. After him was the Wellington carriage which held Bertieâs parents, and another carriage behind that which belonged to Bertieâs brother, Godfrey. Amanda felt herself getting nervous at the thought of mingling with Bertieâs family because of how close she felt to him now. She barely knew his family at all, had only met his mother once. It was time she got to know them. It was time for the party to begin. An hour later, the party was in full swing. A string band played inside in the parlor, and with the windows open, the music could be heard inside as well as outside on the wraparound porch. Food was spread out in the dining room at the back of the house in a room with red walls, white trim, and windows on three sides, which afforded views of the garden and cottage out back. Jason and Belle were the perfect hosts, making sure the food and drink were plentiful. Josiah was his uncle. He didnât travel down for this visit, as Lizzie wanted to stay for four weeks and Josiah could not be away from his occupation as a banker for that length of time. The only other people present were Amanda and her small family â her cousin Jason and her Aunt Paisley. She had lost her parents in an accident three years ago and Bertie knew she missed them a lot, especially her mother. Especially on her birthday. That was one of the reasons he decided to propose marriage to her at her birthday celebration, so that she would have a new memory to think about and something happy to celebrate instead of feeling sad. He was nervous and tongue-tied around her. Heâd been engaged before, had been in love before, but the woman had broken the engagement and he swore off women for many years. Until he met Amanda. In all his twenty-six years, he had never met a more formidable and yet vulnerable woman before. He loved her for her sweetness, her determination, and her courage. Sheâd been through a lot and he wanted to take care of her, more than anything, for the rest of his life. She turned quickly, looking startled. âOh. Would you rather be alone?â Although he thought he would die if he put off proposing to her any longer. âOh, yes. Dancing. Could we, uh, talk for a minute first?â he asked her. He took her hand in his and kissed it, hoping she would comply. He was so nervous that she would decline his proposal. He followed her around to the back of the porch, past the dining room windows where Bertie knew others would be watching. He glanced inside and saw Jason looking his way. He smiled broadly and gave him a thumbs-up. Bertie quickly looked away and nearly stumbled as he followed Amanda down the outside stairs leading towards the garden and stables. When they got to the last bottom step, he placed his hand on the small of her back and pointed towards the cottage and they walked behind it where there was a black wrought iron bench. This was a secluded spot away from view of the house, and it overlooked a tall group of sunflowers and the woods beyond. They walked over to the bench and he motioned for her to sit down on it while he kept standing. She looked at up him curiously, and he looked around them nervously, not wanting an audience for this. He reached into his pocket again and pulled the ring out, not showing it to her yet. He might as well get this over with before he exploded. He dropped down onto one knee and Amanda looked stricken. Did she know what he was going to ask? Why didnât she look happy? âAmanda,â he squeaked and cleared his throat again. He took one of her hands in his and with the other he presented her with a silver-banded ring with a square-shaped small diamond on the top. It was brand new; heâd ordered it at the mercantile a month ago. He could tell she still felt down on herself for her past mistakes. âWhat if I canât have any more children? You know what I did to Brewsterâs baby.â She looked down again and he saw tears in her eyes again, which she tried to hide. She glanced up at him under her long lashes, her green eyes making his insides melt. She finally smiled. âYes,â she whispered. âWhatâs that?â he asked, grinning happily. She smiled even more. âYes,â she said louder. He placed the ring on her left third finger and then leaned down and kissed her sweet lips. Cheryl R. Lane was born and raised in Tennessee and went to college at East Tennessee State University before marrying her high school sweetheart and moving to Virginia Beach, Virginia. She started writing as a hobby while in college after purchasing Southern Heritage cookbooks, which were filled with pages of old plantation homes. She wrote more after moving to Virginia Beach and visiting beautifully restored homes in Williamsburg as well as plantations on the James River. She has been working as a medical transcriptionist for over 20 years while writing on the side, and finally decided to self-publish her first book, "Wellington Cross", on Amazon through Kindle Direct Publishing as well as in print through CreateSpace. She has since published four more books and a novella in that series as well as starting a modern-day fantasy Angel series and has two books in that series so far. 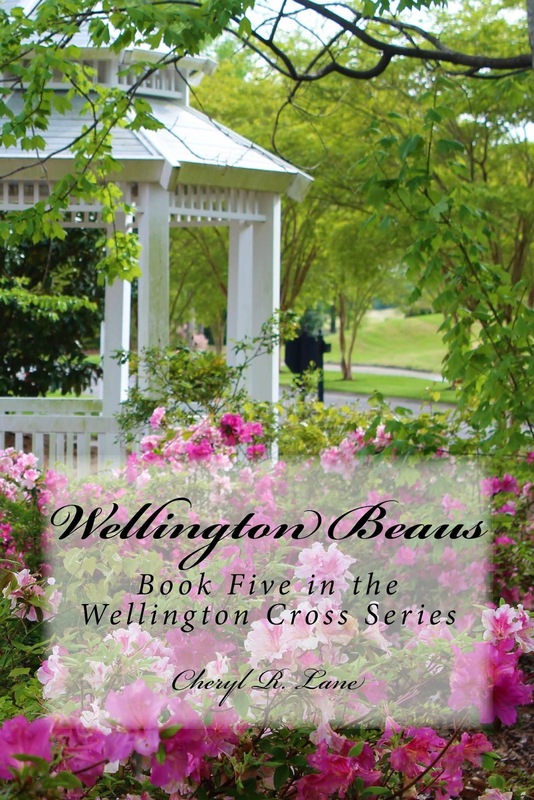 She is currently working on her next novel, book six in the Wellington Cross series. She is still married to her sweetheart after 28 years and they have one son and a Havanese bichon.